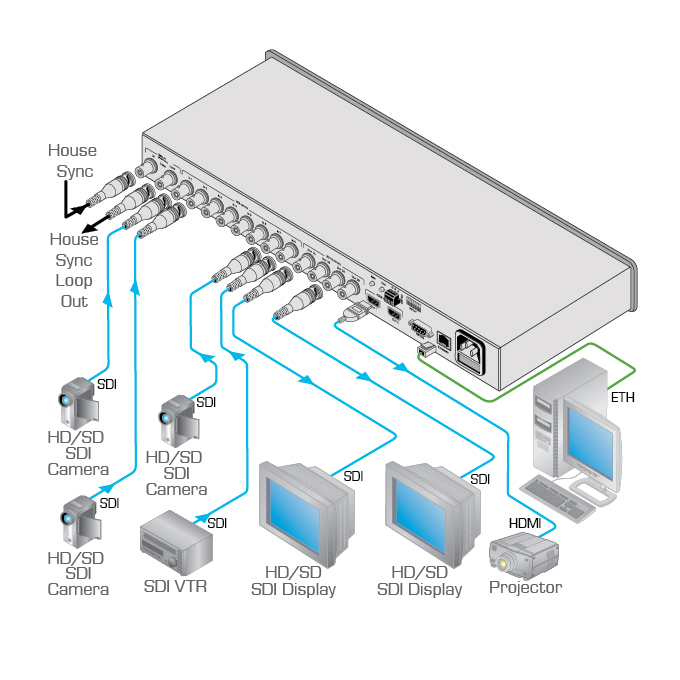 The Kramer VS-82HDxl is a true 8 x 2 matrix switcher for SDI signals. The unit can switch any one of the eight SDI inputs to one or both sets of triple outputs (two-channel SDI and HDMI). Multi-Standard Operation - SDI (SMPTE 259M/344M), HD-SDI (SMPTE 292M), 3G HD-SDI (SMPTE 424M). Clean Switching Feature - When the sources are genlocked to the selected genlock input with a difference of no more than two lines of video. Versatile Genlocking - Can use either an analog signal or any of the SDI input signals for genlocking. If the selected genlock input signal is unavailable, the VS-82HDxl automatically selects the best available SDI input for the genlock signal. Memory Locations - Stores 16 multiple switches as presets to be recalled and executed when needed. Flexible Control Options - Front panel, RS-232/RS-485 & Ethernet.